Bringing attention to the myriad issues surrounding Arizona’s water plight, Ground|Water challenges traditional methods of conveying scientific information to the public. Cast Iron designers Jonny Black’s and Richard Roche’s goal was to create a sustainably-produced object that adequately showcased the intense visual nature of the book’s content which is inclusive of fine art, design, and architecture. 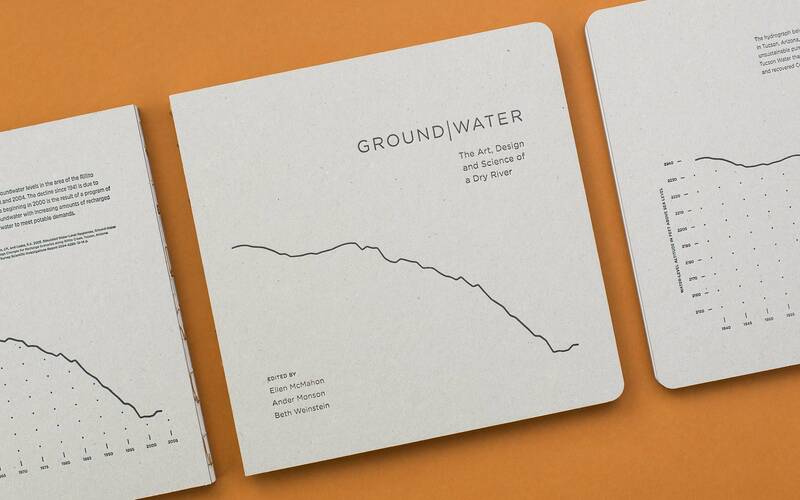 Ground|Water demonstrates how these alternative expressions of information can have a striking impact that is often missing in charts, statistics, and other conventional means of data interpretation. 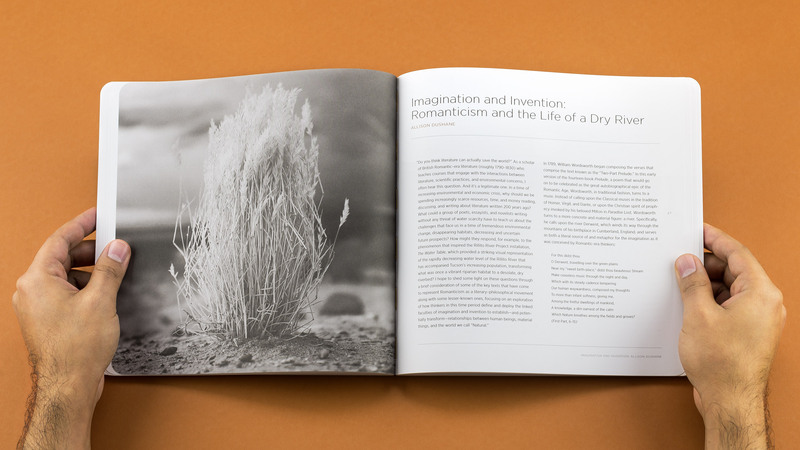 The cover of the book was designed to be stark yet tactile with a startling environmental significance. 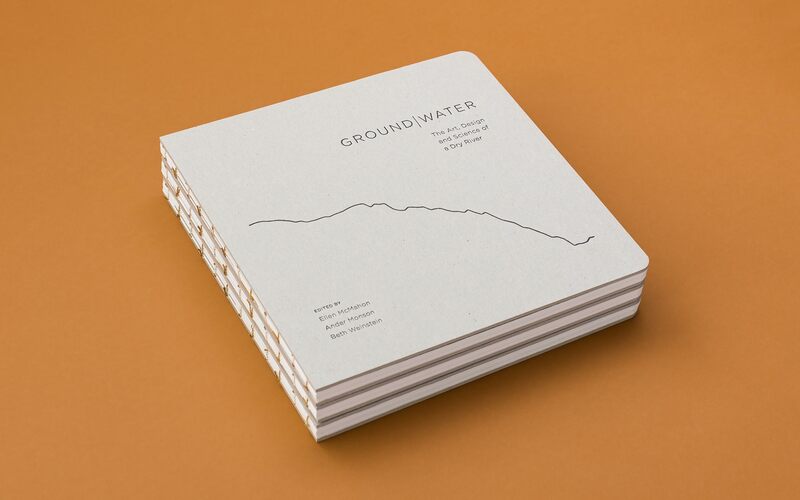 What appears to be a river on the front cover is revealed on the back cover to be a graph of the devastating decrease in Arizona’s water table. Paper coatings hamper the recyclability of printed products by reducing their usable fiber yield, and as a result the designers avoided coated paper in all instances. They used a beautiful uncoated paper for the interior pages and specified a raw, uncoated coverboard to protect the exterior. The sewn binding uses cotton thread, a natural material that can be recycled with the book (without the need for separation) to become part of the next generation of postconsumer paper. The interior pages and endsheets were printed at a wind-powered facility using low-VOC and vegetable-based inks. Distance is also an important contributor to an object’s carbon footprint, and we were able to keep the production of the book to within 2 hours of the publisher’s headquarters. In addition to the success of the object’s sustainability, the book received extremely positive reviews in the newspaper, and has won awards including UCDA – Best in Show, UCDA – Gold Award (Book Category), UCDA – Judge’s Pick, and For Print Only Awards.